The British government on Wednesday downplayed a report that its chief Brexit negotiator said lawmakers will have to choose between backing Prime Minister Theresa May's unpopular divorce deal and a delay to the U.K.'s exit from the European Union. An ITV News correspondent, Angus Walker, said he overheard negotiator Olly Robbins in a Brussels bar saying the government would ask Parliament in late March to back her agreement, rejected by lawmakers last month, or seek an extension to the Brexit deadline. 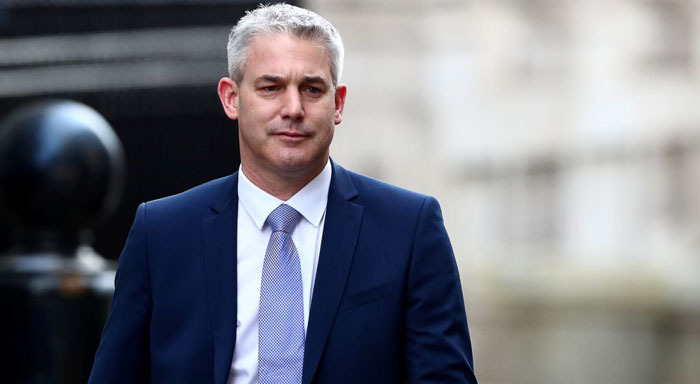 Brexit Secretary Stephen Barclay insisted the government was not planning a delay, saying "the prime minister has been very clear that we are committed to leaving on March 29." Lawmakers overwhelmingly rejected May's Brexit deal with the EU last month, and she is now trying to secure changes before bringing it back for another vote. The EU insists it will not renegotiate the legally binding withdrawal agreement. If a deal is not approved by the British and European parliaments before March 29, the U.K. faces a messy sudden Brexit that could cause severe economic disruption. Barclay said the government wants to secure a deal, but is also preparing for a "no-deal" Brexit. Opposition politicians have accused May of trying to fritter away time as the clock ticks down, in order to leave lawmakers with a last-minute choice between her deal and no deal. On Tuesday, May urged lawmakers to give her more time, promising Parliament a series of votes on the next steps in the Brexit process on Feb. 27 if she has not secured changes to the Brexit deal by then. "What the prime minister is up to is obvious," Labour Party Brexit spokesman Keir Starmer said Wednesday. She's coming to Parliament every other week, pretending there's progress and trying to buy another two weeks, edging her way toward March 21, when the next EU summit is, to try to put her deal up against no-deal in those final few weeks. "Parliament needs to say 'That's not on.'"